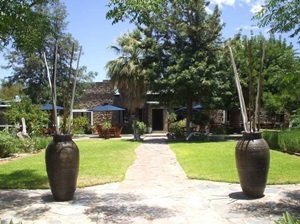 The Helmeringhausen Hotel lies in the tiny settlement of Helmeringhausen in Southern Namibia. It was established during the German colonial era as a farm by a member of the Schutztruppe/German Colonial Infantry. Hotel Helmeringhausen boasts a warm, cosy restaurant with exquisite meals and a refreshing swimming pool. Enjoy a cold beer or a glass of Cape Wine in the well-stocked fully licensed restaurant, whilst you catch up on all the local news or exchange travel information with fellow guests. There is also a cosy lounge with comfortable sofas and inviting fireplace. A hearty buffet breakfast, fresh farm produce for lunch and a three-course, set dinner menu are served in the restaurant. The hotel boasts 22 Rooms as well as a well maintained campsite ( without electricity). 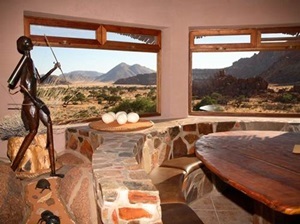 Kanaan N/a’an ku sê Desert Retreat is situated on 33 000 hectares of unspoilt nature. Contrasting landscapes are never-ending, with rippled sand dunes glowing in the magical light of sunrise and sunset, mountain vistas perfectly framing breathtaking views, rocky outcrops studded with quiver trees and awe-inspiring savannah and desert vistas. This enchanting reserve borders the Namib Naukluft Park with its breath taking photogenic dune belt to the west, and the Tiras Mountains to the east, enhancing our captivating scenery. Kanaan is home to free roaming kudu, springbok, ostrich, oryx, caracal, hyena, bat-eared fox and jackal, there is never a shortage of animal action in front of the camera.The Kanaan N/a’an ku sê Desert Retreat offers 4 en-suite rustic and comfortable rooms, serve homely meals and refreshing drinks in the old farm house that has, since in the hands of N/a’an ku sê been fully refurbished. Amid the most beautiful scenic setting N/a’an ku sê is creating an exclusive tented camp for those who are looking for an adventure, ideally suited for wildlife enthusiasts, photographers, geologists, hikers or for those looking to get away from it all. Our campsite is individually bookable to one group only, cooking and ablution facilities are available. Namtib Desert Lodge is a privately owned biosphere reserve covering an area of 16400 hectares at the edge of the Namib Desert in the Tiras Mountains. The fascinating landscape of the farm offers an abundance of breathtaking views and hosts a wealth of fauna and flora. The untouched mountains offer hiking ranging from easy to extreme for the discerning hiker. The mountains rise steep from the plains and their peaks reach high into the steelblue sky. 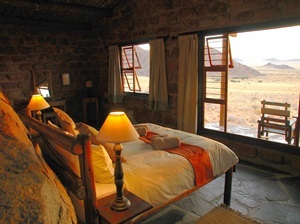 Namtib Desert Lodge offers accommodation in farm style bungalows each with an own bathroom. Should you prefer the outdoors and like camping then the Guestfarm offers campsites at Little Hunter’s Rest, equipped with cooking facilities and ablutions. The area surrounding the camp site invites you to explore its wilderness and absorb the vastness of the desert. 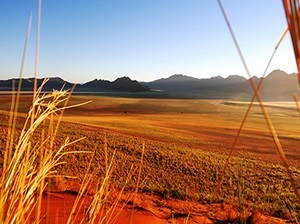 In the midst of the Tiras Mountains, and on the edge of the Namib Desert the Koiimasis Ranch is picturesquely surrounded by red shining granite rocks. The name »Koiimasis« means »meeting point« and comes from the San people (bushmen) who lived here in former times. 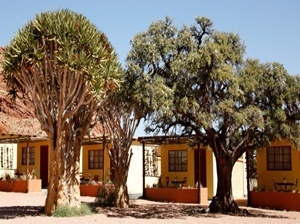 Situated between Keetmanshoop & Lüderitz, the lodge is well known for its fascinating collection of Lithops (Cole Lithoparium), also known as “Flowering Stones”. Alte Kalköfen sleeps 24 guests in total. The rooms are made up of 1 Family room, 8 Twin rooms and 2 Farmhouse twin rooms with en-suite bathrooms . Luxurious beds await you with en-suite bathrooms and both indoor and outdoor showers. At dusk, keep an eye on the floodlit waterhole which attracts oryx and springbuck . The lodge is restored from an old farmhouse. It’s perfectly manicured, yet with rustic charm around every corner waiting to be discovered. Our “Sundowner Ecke” and our “Reading Corner” bring smiles to our guests faces and the bi-weekly passing train is a pleasant reminder of the old historic trade routes. Dine on delicately prepared, delicious meals served throughout the day from our dining verandah. From affording grand vistas into the vast expanse of the desert, the four accommodation facilities are an ideal starting point for excursions: to the Wild Horses of the Namib, to the diamond ghost town of Kolmanskop, into the most diverse desert on earth. 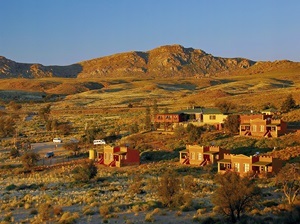 Desert Horse Inn consists of 24 spacious and tastefully decorated en suite rooms. Relax with sundowners on the wooden deck before enjoying a 3-course meal in the restaurant. Exchange travel experiences and recommendations at the evocative Wild Horse Bar or at the cozy fireplace in the lounge. 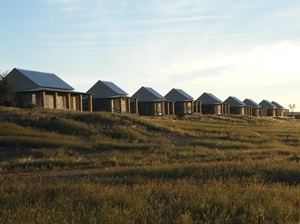 Solitude, silence, space and magnificent sunsets - these are the characteristics of the atmosphere at Eagle's Nest Lodge. A 15 minutes' drive from the reception at the Desert Horse Inn, 8 chalets are nestled against a mountain slope and afford unique views of the boundlessness of the desert. Each of the natural rock chalets sits between massive granite boulders and contains a bathroom, kitchenette, fireplace and private veranda. Meals are served at the Desert Horse Inn restaurant. Several hiking trails run through the valley; the Sundowner Trail leads to a lookout point where you can watch the sun disappear behind the distant horizon at the far end of vast desert plains. The Desert Horse Campsite is just 20 km away from the habitat of the Wild Horses.